397 in stock Need More ? This work is a fun collection of all-time favourite pre-school playgroup songs for everyone to enjoy...and join in with! 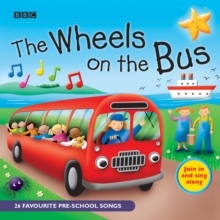 The songs are: "The Wheels On The Bus" - "Down at the Station, Early in the Morning" - "Row Row Row your Boat" - "The Big Ship Sails on the Alley Alley Oh" - "London Bridge is Falling Down" - "Jack and Jill" - "Hickory Dickory Dock" - "I'm a Little Teapot" - "Polly Put the Kettle On" - "Miss Polly had a Dolly" - "Pop Goes the Weasel" - "Five Currant Buns" - "Ten Fat Sausages" - "Peter Hammers with One Hammer" - "The Grand Old Duke of York" - "Girls and Boys Come out to Play" - "I Jump Out of Bed" - "Here We Go Round the Mulberry Bush" - "Ring A Ring Of Roses" - "I Hear Thunder, I Hear Thunder" - "Incy Wincy Spider" - "Heads Shoulders Knees and Toes" - "If You're Happy And You Know It Clap Your Hands" - "Twinkle Twinkle Little Star" - "Wee Willie Winkie" - "Ten In A Bed."